Obama Asks For $500 Million To Train, Equip Syrian Rebels : The Two-Way The appeal is part of a larger $65.8 billion request sent to Congress to fund overseas operations. A White House statement says "moderate" rebels would be vetted before being funded. 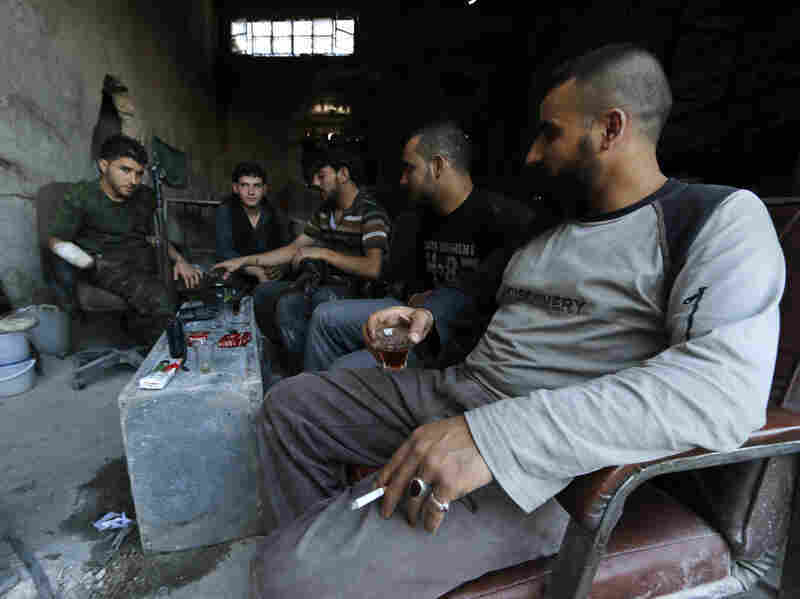 Rebel fighters drink tea on the front line of Ramouseh, near the Aleppo Artillery School. President Obama has requested $500 million to arm and train "moderate" Syrian rebel groups. President Obama has asked Congress for $500 million to train and equip moderate Syrian rebels who are seeking the ouster of Bashar Assad. If Congress approves the plan, it would supplement a covert training and assistance program already being run by U.S. intelligence agencies, The Associated Press says. The White House says in a statement that the rebels would be vetted before providing assistance, to ensure that U.S. equipment doesn't fall into the wrong hands. According to the AP: "The Syria program is part of a broader $65.8 billion overseas operations request that the administration sent to Capitol Hill on Thursday. The package includes $1 billion to help stabilize nations bordering Syria that are struggling with the effects of the civil war. It also formalizes a request for a previously announced $1 billion to strengthen the U.S. military presence in Central and Eastern Europe amid Russia's threatening moves in Ukraine." "Obama has been under strong pressure from some lawmakers, such as Republican Senator John McCain of Arizona, to increase assistance to the rebels in Syria's three-year-old civil war. Some lawmakers have accused Obama of being passive and indecisive for months, allowing Assad to repulse a threat to his government. "Obama's request for $500 million followed through on a promise he made in late May in a foreign policy speech that he would 'ramp up support for those in the Syrian opposition who offer the best alternative to terrorists and brutal dictators.' "